A Dissertation Proposal is considered as an important first step towards writing the final dissertation based on a learned or researched Ph.D Level or Masters course. The proposal has to be original and unique. It must set the base for your upcoming research and help you in making a clear plan for your final paper. In simple words, a dissertation proposal is like a table of contents relating to your research. These assist you in knowing and explaining what you intend to examine. It also indicates your plan for collecting the data. The main objective of the proposal is to help you identify the direction of your final dissertation. Choosing the topic plays a vital role here. You should select a topic which is relevant and appropriate to your field of study and precisely narrow enough to get completed within your course period. Our Professional Assignment Expert will guide you while choosing and writing proper Dissertation Proposal Structure Topics. A good proposal helps you meet both these objectives. This includes your main central research question and provides background on the selected subject and state how it is related contextually to any of the relevant surrounding broad issues. This will classify the sources you aim to use for your research and what kind of data you will gather from it. Whether it will be quantitative or qualitative. In the methodology of the dissertation, you have to state how will you analyze the collected data and mention if there is any bias in your chosen methods. You may also want to explain the reason of why your approach of gathering data is more appropriate to your research as compared to others. Your proposal will include the aims and objectives of your research. Here you have to mention what your research aims to achieve and the predicted outcomes. 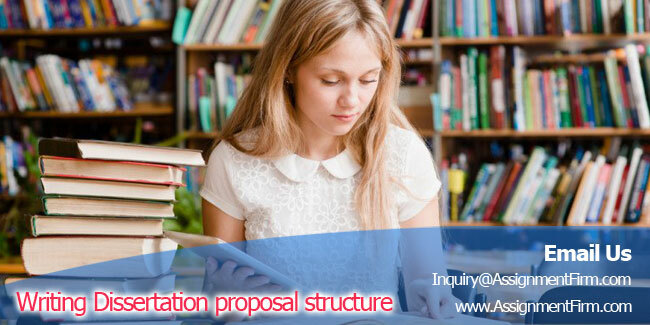 Dissertation Proposal Structure will depend on the specific requirements of your course. Some courses will specify not to include the aims and objectives while others can skip the methodology section. Therefore, once you get a clarity on what is to be included and what is supposed to be omitted, it will help you to focus on your writing of the proposal. Consider writing a narrow title focusing on your topic.